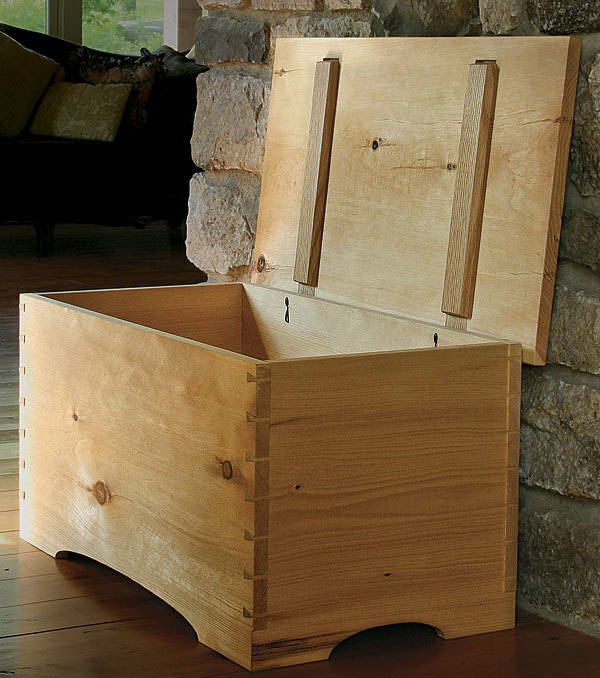 I first learned about Andrew Hunter in a Fine Woodworking Magazine article, in which he wrote about a blanket chest, made of pine. It was astonishingly simple as a whole, made almost entirely of clear white pine, but closer inspection revealed the dovetailed corners and sliding cleats that kept the top from warping. And the whole piece was done mostly by hand. This opened my eyes even more to the power of hand tools. The chest is representative of Hunter’s work as a whole, with his focus on simple, clean designs made mostly by hand. Hunter lives and works in upstate New York. He got started in woodworking when he built a bookshelf for himself during his senior year of college, where he earned a degree in biology. After graduating, he went straight to a cabinet shop for work, never using his degree in the workplace. He learned a lot in that shop, but it was not how he preferred to work. His first tools personal tools included a drill, a circular saw, a hand saw, chisels, and a Stanley plane. With such a limited selection of tools he was forced to learn hand skills, which became his main method of work. Hunter also has a lot of experience with carpentry and timber framing, having done it in the past and occasionally in the present to help make ends meet since the money is better and more steady in that industry than in fine furniture making. 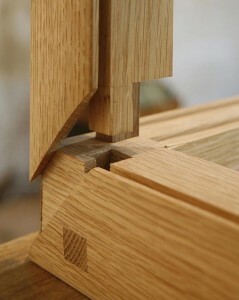 As a result, he is used to using hand tools to shape pieces and dealing with corners that are not square. With skill and interest in handwork, Hunter was attracted to the tools of Japanese craftsmen, which usually cut on the pull stroke rather than the push stroke of Western tools, and are more likely to be made of wood with thick, laminated metal blades. This led to an interest in the design and woodwork of the area. 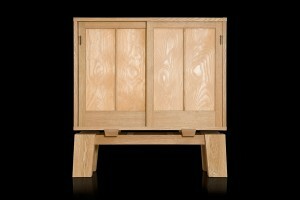 The designs of the Japanese are simple and consist of clean lines while the Japanese are more complex in their designs and joinery. Aside from the design and methods of work of Asia, Hunter is particularly attracted to the philosophy of Asia, including Buddhism, that is behind the designs and methods of work. Craftsmen in that region do their work with a sense of presence and zen that Hunter also seeks, and that is well suited to work with hand tools. Hand tools are essential to Hunter’s work as they allow him to create pieces not limited by machines or squareness. That is not to say that machines don’t play a major role in his work, though. He uses them as much as possible for the rough milling of lumber and tasks such as mortising, which are extremely labor intensive and can be quite dull. To do them by hand would also not be effective economically. Hand tools complement the machines and take the work to the next level, as he cuts joinery and planes the surface of boards. For these tasks the piece does not have to be machine square, giving him a lot more freedom to work. finished product. 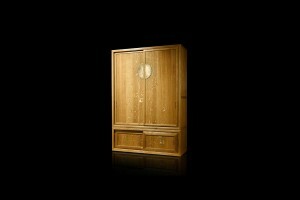 Woodworking is a battle with the wood which the craftsman wins by being highly skilled. Those hand skills are being lost today as craftsmen move toward machines with more power, capable of doing the work more quickly and with less effort. In an effort to return the focus of the craft to skill and intimacy, Hunter is very involved in teaching. He makes sure that hand skills are still appreciated and in use. He is also exposing the Western world to the tools and designs of Asia, which are not widely known but are beautiful and have distinct advantages. 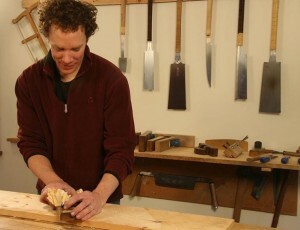 Hunter likes to say that woodworking should be about “blades, not buttons,” and is working to make the statement more true in the modern age. A lot of these woodworkers seem to earn a degree in college before going into woodworking (which, obviously, does not require a degree). Why do you think that is? It seems curious to go to school for a degree to do a job that doesn’t have one. It is interesting how he was influenced by Asian tools and philosophy. 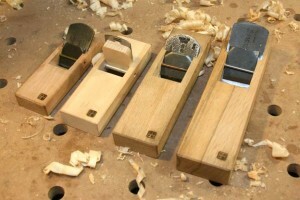 As the world has become more globalized, it makes sense that these woodworking methods would spread. Would you say that Asian countries have less modern tools than those of the U.S., so their method of woodworking is less modern? Or, is their woodworking method influenced by eastern religions like Buddhism? The second to last picture is pretty amazing. It must be extremely difficult to get these dimensions to the perfect ratio. So far, I think Hunter is the craftsman to impress me the most with the cleanliness and precision of his work. The fact that he works by hand is admirable and I think it makes each one of his pieces that much more impressive/special. I love the fact that he appreciates work done by hand. Some of the pieces look so intricate and they showcase his skills well. I want to thank you for your talk given at the CJWA last night at the Old Brick Church. Not only did I take away a different approach to woodworking, but was inspired by your insight to the joy of learning by doing. There are many times when I have been frustrated and have thoughts of saying to Hell with it all. You have given me a new understanding about appreciating the process to reach the end and a renewed desire to make things that count. We have much in common having been a builder and grew up in the trades at a young age.